'Wipe Clean' by Katie Guthrie at The Suttie Art Space! 'Wipe Clean' is possibly the final project of 2016 for the busiest woman I know, Katie Guthrie! Capping off a great year which has seen her win the top prize for the Live Project at this years Graphic Design Festival Scotland, not bad considering she's only quit her job this year to focus on learning graphic design and producing a fine series of labels for Dornoch Distillery on top of all the crazy personal work Katie's been producing, her productivity has been incredible. And to finish things up we're all invited to take a step into Katie's unique world! 'Wipe Clean' is a a large scale chalk mural created by Katie at the Suttie Art Space at Aberdeen Royal Infirmary. Hospitals being what they are aren't always the happiest of places but if you pop along the main corridor you'll be met by the sight of a giant pink and black worm, a floor to ceiling pink and black behemoth with the happiest little grin. The idea behind the show is that people can pick up some chalk and add their own creations to the wall, creating an ever changing and growing mural. I believe Katie will be creating a different works as the show goes on through into early January. With a wealth of original characters on her instagram feed she has lots to choose from. Being among the first to arrive at the gallery I found myself confronted with a relatively clean walk, a quite intimidating sight really. Luckily Katie's wee boy had made start on adding to the existing mural and any inhibitions were quickly forgotten. And it was through quite a simple act that the brilliance of such a show begins to shine through. All too often we find an excuse not to draw or be creative, whether its self doubt of your abilities or just not making the time or starting but never finishing a project. But when confronted by a blank wall and giant chalk sticks its hard to not have a go, even if its just to draw some squiggly lines. And once you start its hard to stop, Mary had to drag me away from the walls by the end but mark my words, ill be back! Katie is without doubt one of the hardest working artist's I know and really has worked for all her success this year and 'Wipe Clean' is the perfect way to end the year. 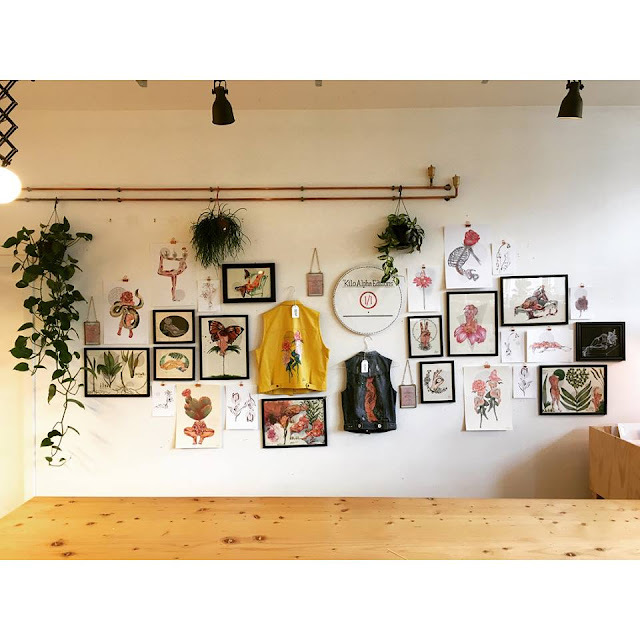 She will be popping back to the gallery over the next month to clean and add new pictures to the walls so be sure to follow her instagram to keep up to date and be sure to pop along to the Suttie Art Space to have a draw yourself. Here's to an even bigger and better year in 2017!